A project that skilfully combines dietary exposure, tasting, preparation, consumption, exclusive participation to presentations, events and cooking shows. Love it, which is involved in the selection and international promotion of Italian food excellences, has chosen TM Italia for its first flagship store in Milan. 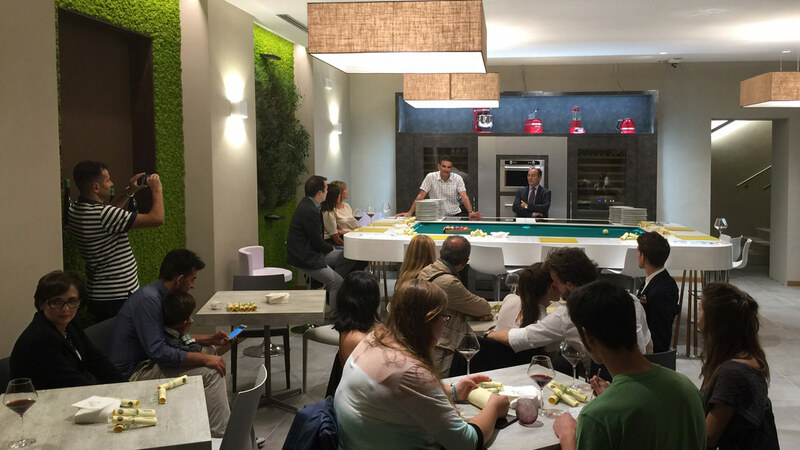 It is confirmation of the successful collaboration and successes achieved by Love it during the Milan Expo, in which it exhibited an unusual project and a careful selection of culinary excellence inside the domes designed by the Tagliabue studio located between the Tree of Life, the Italian pavilion and the European pavilion. 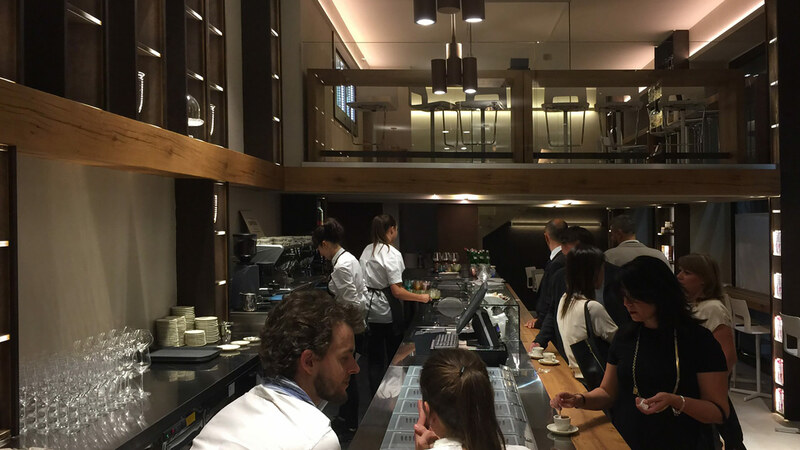 The space in Via Rugabella is distributed on three levels: a ground floor with access to the store and shop windows overlooking Via Rugabella and Corso Italia, a mezzanine floor and a basement dedicated to cooking shows. The set of materials selected by the architect, Laudini, is a combination of knotted oak and metal with a shabby brass finish. 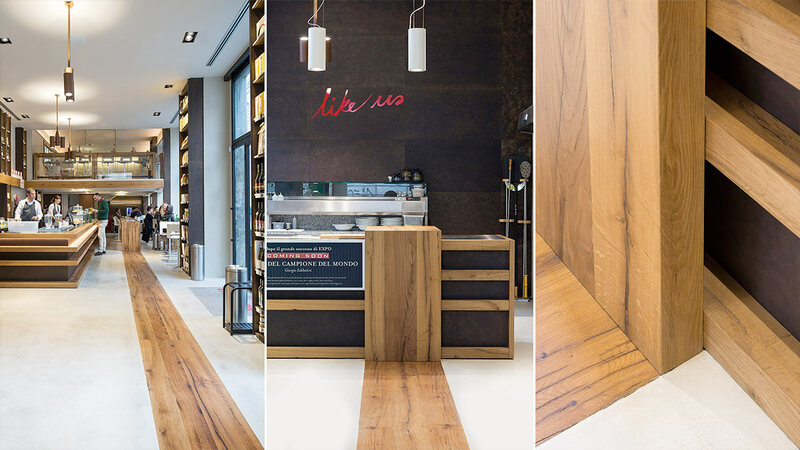 Oak planks run throughout the architectural space and link the various counters for the preparation of food in an ideal theme across the flooring, on which it was embedded before the resin was poured. There is double access to the store, at the pizzeria area and the coffeehouse area. Both counters are made by TM Italia. Both are made of wood (top, intermediate layers, bottom layer, upper countertop and back/side portals). The back panels between the layers are made of metal. 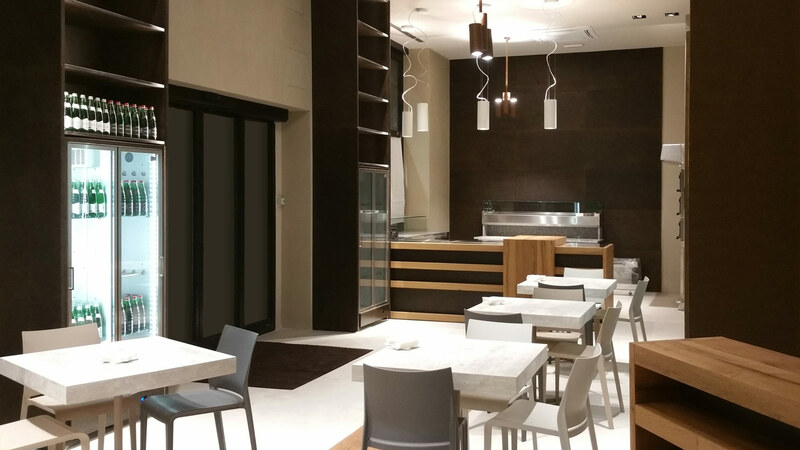 The long angled counter of the coffeehouse-ice cream shop area is also equipped with an internal platform containing various electrical and plumbing connections. The counter is also equipped with refrigerated display cases and three metal countertop racks with concealed LED lighting. The cash counter is made using the same finishes and technical solutions. 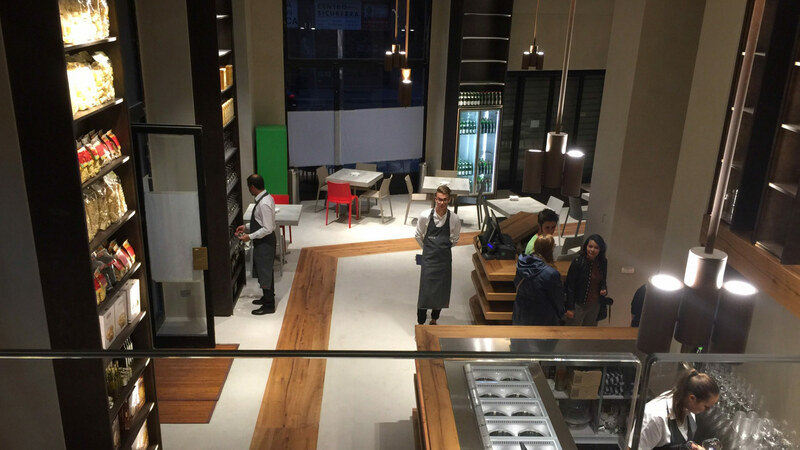 The oak planks, embedded in the floor to ideally link the different specialisations of the store, rises from the floor and becomes a counter complete with stools for customers in the coffeehouse area. 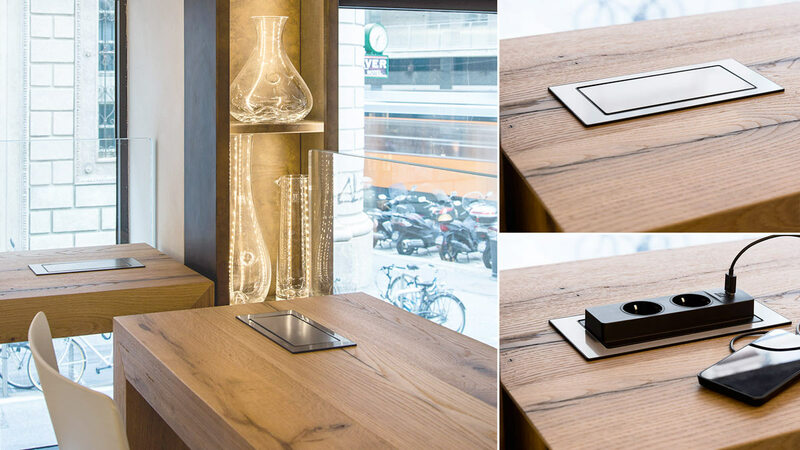 The two table counters are equipped with electrical connections (Schuco and USB) with flaps concealed in the body of the wood. Three more counters with the same features leaning against the shop windows complete the fittings below the mezzanine. The seven food display shelving units are all made of metal and equipped with concealed LED lighting housed along the sides. Two of the shelving units are 60 cm deep so that they may contain refrigerated display cases in the bottom parts. The others are all 30 or 20 cm deep with varying widths. They are all custom-made and full-height, over 5 metres between the shop windows. There are six more display columns suspended above the coffeehouse counter. There is a suspended, six-unit, metal frame-finished refrigerated display case embedded in the wall next to the pizzeria counter. On the ground floor we were also made All the doors on the ground floor were also made, with finishes matching the custom furnishings and building systems (concealed, overhead, armoured). The interior design project also includes all the various custom-designed cladding, wall panels, ceilings and panelling, as well as the handrails and other coordinated architectural details using the same set of materials. 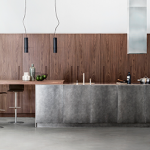 The fittings consist of two display shelving units and four wooden counters with the same characteristics as those on the ground floor, all custom-made. At the centre of the mezzanine is a large glass case that provides a visual link to the coffeehouse counter. The case, which has access on the short side for setting up displays, is made of extra-clear laminated glass and was custom-made and installed by TM Italia. The fittings include cladding, a cover for the food cabinet lifting mechanism and a battery of refrigerated food display cabinets. 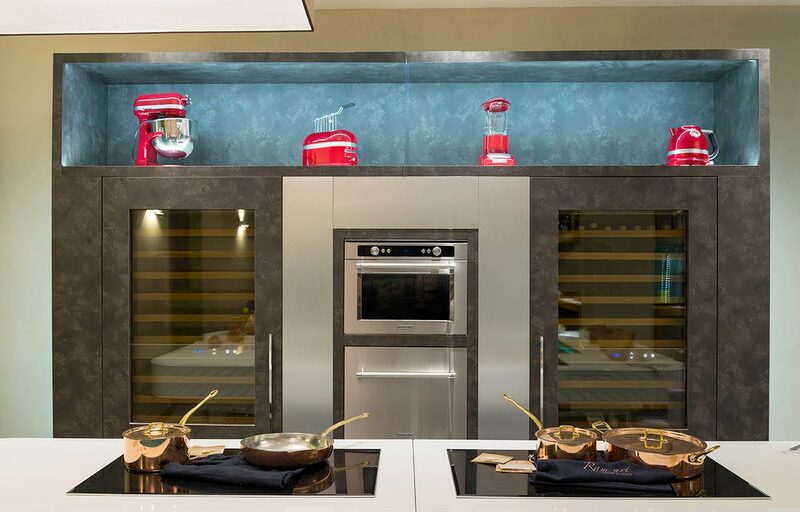 A space dedicated to cooking shows can be found next to the open plan kitchen, separated from the dining area by extra-clear laminated glass walls, together with counters and suspended display frames made of knotted oak. The space is fitted with a show-kitchen for immersive cooking performances and vertical aromatic plant gardens. The fittings include three full-height metal shelving units, custom cladding and panelling, technical units, doors and other architectural details.